I’ve been making some delicious curries lately. This is one of the tastiest so far. 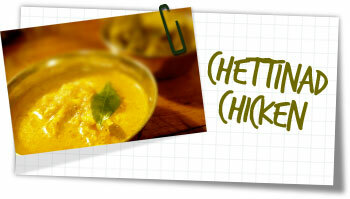 Chettinad, in the south of India offers up flavours amongst the spiciest and most aromatic in the country. This dish is both rich in flavour but also spice. A hot, delicious curry which leaves the mouth tingling for minutes after each bite. I have reduced the amount of spice from the original recipe – instinct told me that 12 red chillies and a teaspoon of chilli powder would render the dish a little too hot even for my asbestos mouth. But fear not, spice lovers this still packs a punch. It’s pretty easy to make too. In a small frying pan, dry fry the poppy seeds, fennel, coriander, star anise, cumin, red chillies, cinnamon, cardamom pods, cloves and dessicated coconut for 1 minute until fragrant and lightly browned. Place in a spice grinder and grind into a fine powder. If you don’t have a spice grinder, use a pestle & mortar, just make sure you grind the spices finely enough. In a food processor, blend together the onion, ginger and garlic into a thick paste. Stir in the spice mix and set aside. Heat the oil in a large pan over a moderate heat. Fry the onion paste for 5 minutes until softened. Add the curry leaves and stir for 1 minute. Add the tomatoes and turmeric and continue stirring for 5 minutes until broken down. Add the chicken and cook for 5 minutes, stirring. Stir in the yoghurt, lemon juice, salt and 300ml water. Bring to a simmer and cook, uncovered for 45 minutes until the chicken is tender, stirring occasionally. Remove from the heat, add more salt to your taste if needed and stir in the coriander just before serving.